New Year’s resolutions are not just for the young. Whichever stage in life a senior is in, there are always ways to grow and new things to learn. Encourage your loved one to make a few New Year’s resolutions this year. 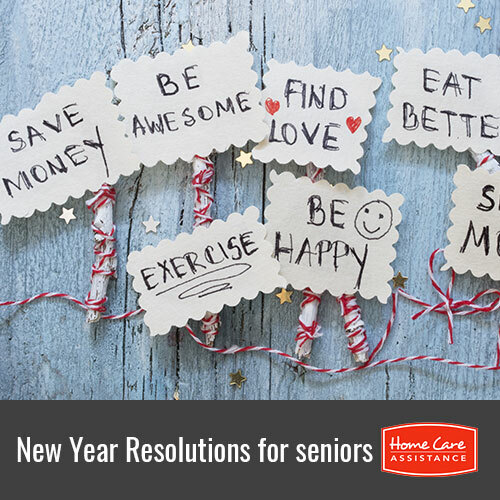 Harrisburg elder care professionals recommend the following 5 resolutions your loved one should consider making this New Year for a healthier and more productive 2017. One of the top reasons your loved one many want to move into an assisted living facility is because he or she is not as mobile anymore and needs someone around to help. By practicing squats and other strength exercises that use the body’s own weight, your loved one can maintain mobility and a higher quality of life. Your loved one might want to consider getting a personal trainer to keep him or her accountable and make sure proper form is being followed. There is something indescribably soothing about nature, with its symphony of sights and sounds changing throughout the seasons. If your loved one is up to it, he or she can start practicing a snow sport or just visit a winter resort to appreciate the unique beauty of this season. However, your loved one prefers to avoid cold weather, he or she should commit to spending at least ten minutes outdoors every day once the warmer months roll around. Being outside can include a walk around the neighborhood or time spent gardening, which is great exercise if your loved one has limited mobility. Your loved one probably grew up in a world where computers weren’t very common. However, it is never too late to start learning how to use them. On top of the benefits of learning a new skill, computers can open up a whole new world of communication and learning for your loved one. He or she can use a computer to keep in touch with friend and family by email, join an online community, or explore different hobbies. If your loved one does not have access to a computer at home, he or she can visit the local library to use one. The library may also offer classes to learn the basics of using computers. In a time when most people are busy consuming, there is something magical and healing about making things by hand. There are many options to explore, including quilting, woodworking, painting, knitting, and crocheting. If your loved one wants to put even more love into the hobby, he or she could give away the items he or she makes to family and friends, sell them for extra cash, or donate them to a cause. For example, your loved one can send quilts and blankets to homeless shelters or give knitted caps to people with cancer who have lost their hair. Letter writing is an art few people practice, yet so many love receiving letters. Your loved one can write letters to his or her spouse, wooing him or her again as if they were still newlyweds, or he or she can write to family and friends telling them how much they mean to him or her. Your loved one can share stories from the past and give bits and pieces of advice in the letters. Even if your loved one writes just one letter a month, he or she will still be sending out twelve letters during the year. Your loved one has a lot of love stored up inside, so encourage him or her to start writing it down and sending it out to the world. Setting a New Year’s resolution can give your loved one a sense of purpose and boost his or her sense of wellbeing. A caregiver from Home Care Assistance can further increase your loved one’s overall wellbeing by providing physical and emotional support. We are a leading provider of live-in and respite home care Harrisburg families can trust. Call (717) 540-4663 to learn how our caregivers can help your loved one live independently at home for as long as possible.